Slight surges in temperature have broken open miles of ice-covered water along the Eagle River. With the onset of Spring in the Vail Valley fly anglers have begun to crawl out of their arctic caves. Water temperatures have risen causing the first true emergence of mayflies, the Blue Wing Olive. The Spring BWO hatch produces predictable angling and a welcome back to dry fly fishing. Blue Wing Olives or Blue Winged Olives are often just referred to as BWOs. And the name BWO has developed into a generic term used by fly anglers for any small spring or late fall mayfly. These small mayflies in the Baetis genus represent a prolific insect with a huge variety emerging across the Colorado Rockies. Blue Wing Olive describes the dun, blue-gray colored wings of these small mayflies. The body maybe olive in color but could be gray, brown or black. The majority will be small in the 18-22 size with the occasional size 16 in the Spring depending on the watershed. BWOs in the nymph stage are strong swimmers. The nymphs will drift a long distance during the hatch. Matching the specific stage of development with the majority of the insects in the river leads to repeatable angling results. Small, slender nymphs mimic the early stage of Blue Wing Olive mayfly development well. The real nymphs possess two antennae and three tails with the center shorter than the other two. Nymphs are found dispersed throughout the entire watershed where gravel, rock and vegetation are present but not in settled dirt bottoms. Silted bottoms tend to smother productive mayfly nymph habitat. Cold unpolluted waters have higher hatch densities and are ideal for BWO development. During the emerging stage the insects cover a large amount of water often drifting in swift, shallow currents. The emergers float a great distance before breaking through the surface film and their nymphal shuck. The emerging BWO has lost most of the ability to swim and begins to ascend with the help of a small bubble that forms inside the shuck separating the bug body from the nymph skin. Many struggle to complete this difficult step leaving deformed, “stuck in the shuck,” cripples on or near the surface. The adult BWO emerges and floats on the surface to dry its wings. There are multiple factors affecting the drying time the wings need to become functional. High humidity or rainy afternoons cause newly hatched adults to remain on the surface for an extended amount of time. Adults will accumulate in slow eddies, rocky corners and grassy edges en masse. Because the emergence stage in BWO development is so taxing many naturals become crippled in the process. Splitting out of the nymphal shuck often deforms wings and traps legs. Struggling emergers are easy targets for strong swimming trout. Cripple patterns always fool wary trout. Females return to the river to lay eggs. The small-eyed females, males have large red eyes, crawl under the water to lay eggs on the downstream edge of rocks or woody debris. The females regularly drown during or after this process. The drowned females make up the majority of spinners during the BWO hatch. Trout can become ultra selective at this time frustrating many anglers. Good nymphing water covers the entire river. However a heavily silted bottom is not a productive habitat for BWO nymphs. Wide smooth riffles with a swift pace and shallow depth become active feeding areas for hungry trout targeting BWO nymphs. Eddies and tail outs below fast water are prime target areas for emergers. Smooth, flat water will concentrate adults sailing on the surface drying their wings. Cripples tend to concentrate in recirculating currents along banks in strong eddies and in mid river foam lines. Finicky trout will eat the spinners both off the surface and drowned. Fished as a dropper or tied with a bead a spinner pattern in the afternoon provides excellent results. When fly anglers approach the Spring BWO hatch some helpful tactics will enhance your catch rate. The size of these insects necessitates going light on your tippet 6x is common. Long leaders will create necessary distance and present small flies delicately without putting fish down. 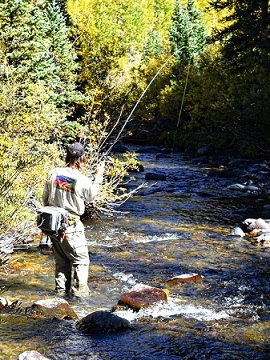 Extra effort to remain hidden from view enhances wading angler’s chances. The gray days that produce the best BWO hatches makes colored shirts stand out against stark backgrounds. Keeping out of the water spooks fewer fish too. Try making your initial casts from the riverbank after observing any noticeable feeding patterns. Extending your drift with longer casts keeps flies in the targeted feeding zone for a longer period of time with careful mending. Successful nymphing techniques demand anglers get your flies down deep. The BWO nymph is very active along the bottom of the river. Nymphs get knocked loose in the current and swim to new locations. The popular jig-style flies use heavy beads and thin bodies to mimic this stage with great success. Fish the jig hooked flies in tandem with a smaller BWO nymph or a midge larva. These heavy, beaded nymphs position the two flies down deep where both bugs are increasing in activity. As the hatch progresses moving up into the water column with lighter weighted nymphs maintains success. More free floating nymphs such as the RS2 or a soft hackle pheasant tail breath in the water. Allowing these nymphs a moment to rise up with the tension of the current at the end of a drift mimics a vulnerable stage in BWO development. These emergers become easy targets for hungry trout. Trout targeting BWO emergers have visible backs and tails in the rise forms not heads. Once the adults are on the surface in great numbers trout can key in only on adults. The high floating mayflies need to allow their wings time to dry and become active creating easy targets in slow pools. Trout will target adults one after another like my daughters with a bag of popcorn at the movies. A drag free drift is critical for dry fly success. The water volume increase makes nymphing a heavy taxing endeavor. The 5wt fly rod is the perfect match for the Spring BWO emergence. 5wts are able to handle cumbersome nymph rigs as well as lay out dry flies and emergers with an equal amount of proficiency. This is not the arena for your highest price stick. Those days are reserved more for summertime. Spring can have an abundance of icy banks so a strong-backed, soft-tipped rod excels in these circumstances. An economical example would be the 5wt Echo Carbon XL. Stepping up in style and performance would be the 5wt Sage Pulse, which comes in a variety of lengths. Both rods are available through Vail Valley Anglers. Large trout start to show up during the Spring Blue Wing Olive hatch. Quality reels will protect lightweight tippets when a bruiser starts to run. The new Ross Animas or Galvan Torque both provide the necessary stopping power for increasing springtime success. Vail Valley Anglers recognizes the importance of the springtime Blue Wing Olive emergence by stocking a wide variety of flies. When it comes to stocking your box with flies all anglers will want a representation for each stage in development. Nymphs, emergers, dries and spinners will cover all the stages effectively. The Pheasant Tail nymph and Barr’s BWO nymph are two good choices for the earliest stage in BWO development. The Perdigon or Pocket Picker are two excellent jig hooked nymphs for getting it down deep. A Pheasant Tail Soft Hackle or RS2 mimic emergers easily when nymphed or fished Dry dropper style. The world famous Parachute Adams is the best representation of a BWO adult for dry fly fishing. Choose dry flies in sizes 16-22 for springtime success. It would be a good idea to sift through the other BWO patterns in the Vail Valley Anglers fly bins. You may find that perfect little secret fly to up your chances. Spring signals the first true predictable mayfly fishing for Colorado fly anglers. Hitting the water knowing how to decipher the Blue Wing Olive hatch increases your chances for a catch. Choosing your gear and flies to match each stage of BWO development ups those odds. 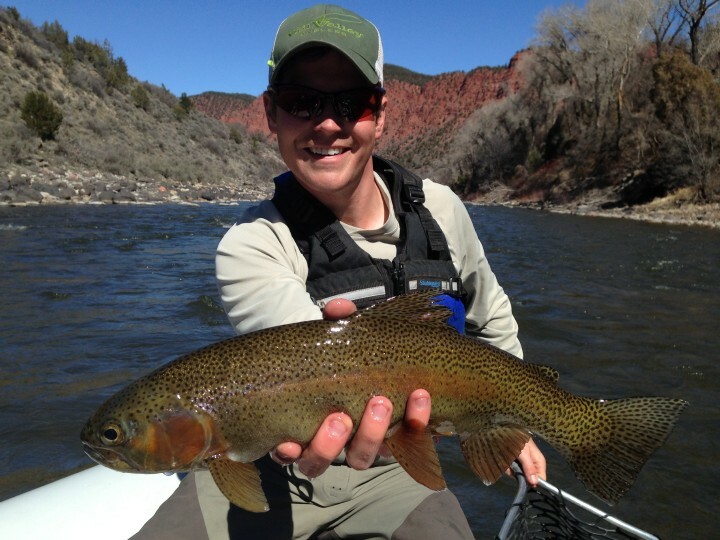 Booking your fly fishing time with Vail Valley Anglers increases those chances even more.